I'm continuing my investigation of active speakers, after sampling offerings from Hypex and sE, and a name that keeps coming up is Dynaudio. I still own a pair of Dynaudio Contour 1.8 mk2 speakers, which I've always liked very much, so I certainly know the company, and I was wondering what Dynaudio could do with an active system. I really wanted to try the BM6A MKII monitors, but Dynaudio preferred me to review the new DBM50 desktop speakers. On paper they didn't look that different, and the DBM50's seems to have been received very well indeed, so I agreed. 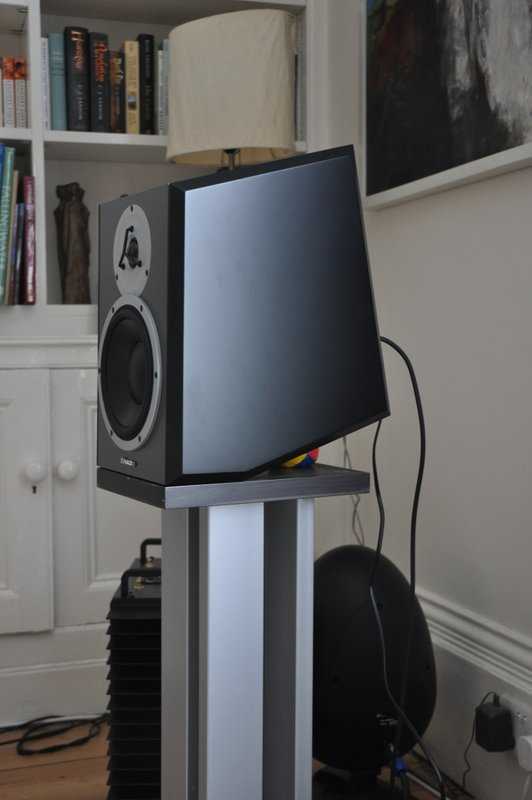 The DBM50 speakers are actually designed for use on a mixing desk and not for use on a stand. They are also rated for near field and not medium to far field as is the case in most normal listening rooms. This might seem like a strange choice, but the guys at Dynaudio should know what they're doing, I suppose. It turns out that they were sort of right, but I still suspect the design might work better on a desk. When put on a stand the speakers will clearly point up too much. The sound is OK-ish and it doesn't look too bad, but I still thought it wasn't the best way to use them. I ended up putting soft juggling balls underneath each speaker, enabling them to sit upright and be aimed straight at the listener. This sounded better, but looked rather weird, and wasn’t completely stable, so it isn't something I can recommend, to be honest. 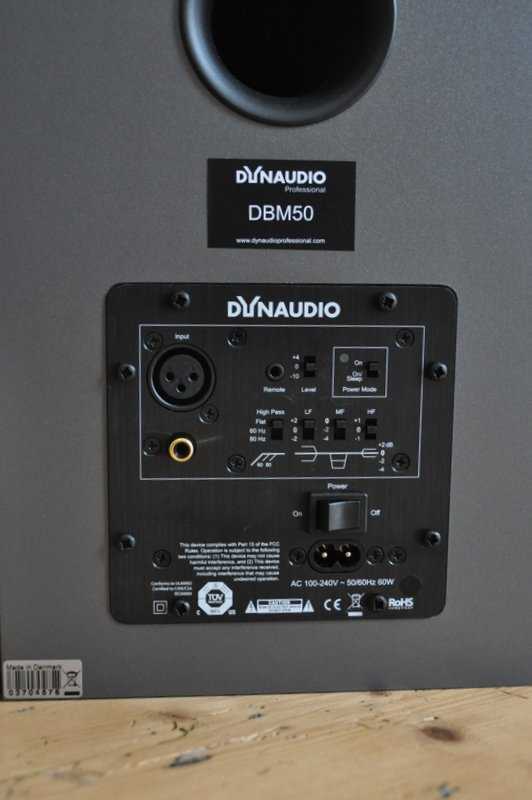 I have to add that the recommendation that Dynaudio gives in the user manual is to point the speakers straight at the listener, so acoustically this should be best. The speakers contain 2 amps of 50 watt each per cabinet, and a DSP based crossover. You might now expect that they would also have a digital input, but they don't. The DSP is used as a replacement for an electronic crossover, and not to enable any added functionality, it seems. The back does show all the controls you'd expect on a speaker like this: 3 sensitivity settings, bass and treble adjustment, a high pass filter (60 and 80Hz) for use with a sub, and an additional mid-range filter to compensate for the effect of placing the speaker on a larger surface, like a desk. The speakers are ported at the back and feature both XLR as well as RCA input connectors. The bass driver is 18cm, so decent bass could be possible. Build quality is fine, but they don't come with a wood finish, like most domestic speakers, making them look a little bit boring, I suppose. The look is just about saved by the darker side panels and the white speaker surrounds. They were very easy to install and didn't give me any trouble at all. I used them with everything set flat initially. Signals were provided by my Astin Trew At3500+ CD player and my Django transformer preamp, which all seemed to work very well. First impressions were fine. This is a punchy and lively sounding speaker with a healthy amount of bass. 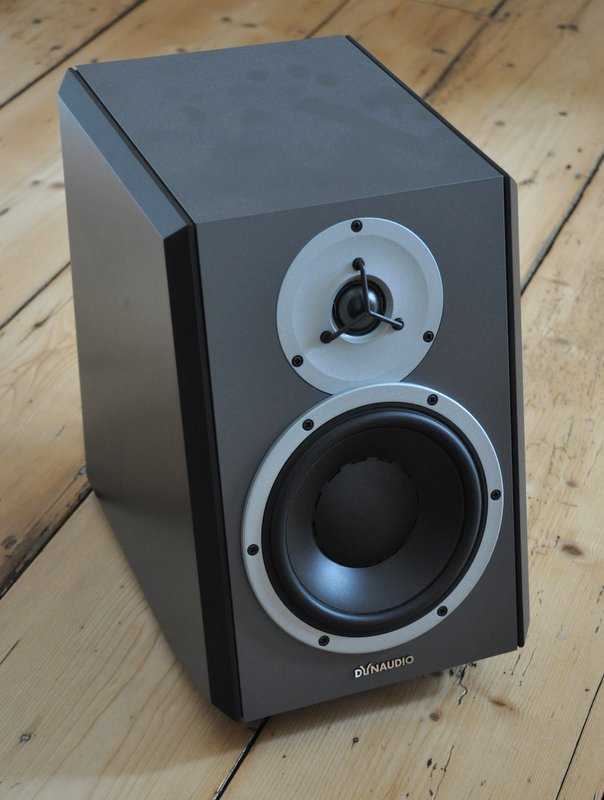 It can certainly play loud enough and seems to be coping well with being used as an ordinary living room loudspeaker. Obviously, when I put them on stands as they are, they are pointing towards the ceiling, but my trick with the juggling balls (see photo) solved that, and when used this way they perform normally and actually produce a decent soundstage. When playing pop, rock and big orchestral jazz and classical music, these monitors are quite impressive, especially for their price and size. Bass is strong and punchy, resolution is fine and they display all the usual active speaker advantages like tight bass, good clarity, good focus, and excellent dynamic expression. What also caught my ear is that they seem to be particularly good at adding a bit of body to voices and instruments. Saxophones have a satisfyingly full and weighty sound, for example. So far, so good. I even played around a bit with the settings and ended up sometimes preferring the +2dB setting for the bass for certain recordings, at least at lower volumes. The added bass gives the sound even more weight and impact, but at higher levels, or with recordings that have stronger bass, it can become a bit overpowering. Still, it is nice to have the option of turning it up or down. I was a little bit disappointed when I started to play smaller scale jazz and life classical recordings. My own Munro Egg loudspeakers excel at this, and are able to recreate the acoustics of the recording space in a quite convincing way. In comparison, the Dynaudios lacked refinement and sounded a bit grainy and rough. For some reason, most of the low level fine detail was lost. When I played well recorded jazz, like most ECM releases, the magic that my Eggs can produce was completely gone with the Dynaudios, and performances sounded indifferent and even mechanical. Every feeling of tension in quieter bits was lost. Sadly, this makes listening to anything a bit more subtle quite unrewarding. I cannot help thinking that this has something to do with the DSP crossover, but I can't really be sure of this. Whatever is going on, there's something in the electronics that makes these speakers sound grainy and unable to reproduce fine, low level detail. For me that disqualifies them as audiophile loudspeakers. 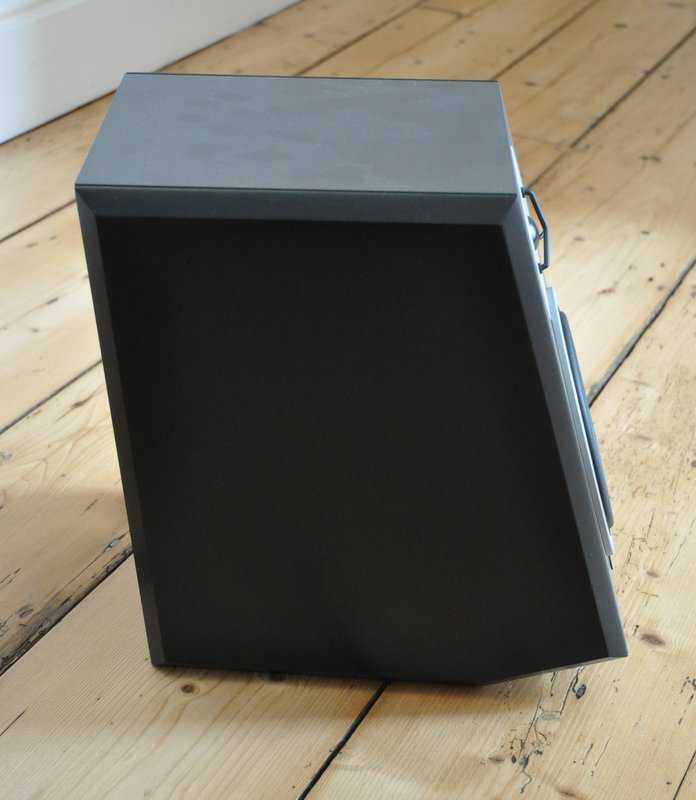 This speaker is intended to be used on a desk and is therefore less at home on a pair of stands. Although this is a reasonably good sounding speaker, I was slightly disappointed by the lack of refinement. If you mostly play pop or rock then this is as good a small speaker as you are likely to find in this price range, passive systems included, but if you like a bit of jazz and classical then they are not very rewarding and better alternatives can be found. The bottom line is that this is simply not an audiophile loudspeaker. That is not to say that it couldn't be an excellent monitor, but for home use I'd recommend against it.